Every individual has unique preferences; specifically when it comes to food choices. Some of us may prefer vegetable recipes while others are meat-eaters; and some are palpable seafood lovers. If you are among those who are fond of seafood, then Dubai has got a bounty of options for you. Ranging from the grandeur Dubai buffet restaurants at seven stars to a budgetary creek side restaurant, you have got all here in Dubai. Dubai offers the best variety of seafood dining and recipes from all over the world. Though you will certainly find some seafood servings in the menu of every good restaurant, but there are some special treats of Dubai that you should must try on. Dubai has a wide range of small, medium and large restaurants that offers seafood in their menus. Here you can find the best flavors of the international cuisines prepared from high quality ingredients offered at very fair prices. Although Dubai has a reputation of being excessively pricey, especially in regard of feasting; however the city devours diverse option of eating with respect to price, quality and ambiance; which allow visitors to pick and choose as per their needs and spending. 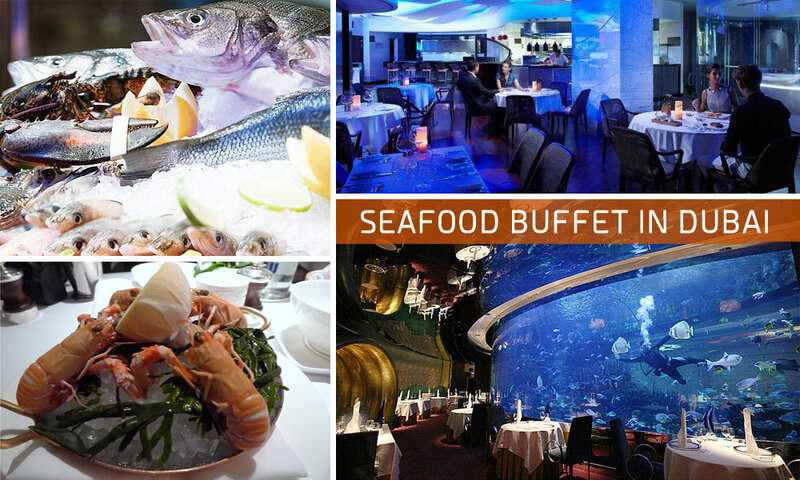 Here revealed are the best five seafood buffet in Dubai, that offers you the best variety of shrimps, oysters, fish, prawns and crabs. Al-Mahara offers the best seafood buffet in Dubai with mesmerizing ambiance. Here you can unquestionably find the flavors that your taste buds dribble for. Al-Mahara should be your first priority for having the heavenly cooked shrimps, fish, crabs, prawns, lobsters and crabs. Al-Mahara is an ultimate pleasure if you look for a perfect night out; as the ambiance is quite quixotic and beautifully decorated with a giant aquarium that adds great value to the dining experience. Al-Mahara is located on the ground floor of Burj Al-Arab, Umm Suqeim Dubai. Blue Flame is yet another marvelous choice for enjoying a great seafood in Dubai. The restaurant has fabulous tastes and dining for seafood. The ambiance is specifically crafted alluring with blue lights. You may find a great variety of luscious seafood recipes including sushi, sashimi, king prawn, butterfly shrimps, lobsters and oysters. The cocktails and deserts are also lip-smacking. Blue-Flame is the wonderful place to make your visit memorable with your loved ones and families. Blue Flame is located at the Mezzanine level, Jumeirah Creek side Hotel Dubai. Prior reservation is recommended. For all those who are frilly eaters, Anise is a great place to enjoy scrumptious seafood meals in Dubai and amazing cocktail. At Anise you may find the delicious variety of Arabian, Middle Eastern, Asian and Continental seafood recipes. Their king prawns, sushi and Indian fish curry are the premium seafood delights in Dubai. Anise is situated at the lobby level of Intercontinental Dubai Festival City. The place offers a great buffet selection for breakfast, lunch and dinner at a reasonable price. Prior reservation is recommended. The Vila Beach Restaurant is one of the best priced seafood buffets in Dubai for locals and visitors. You may enjoy the calmness and peace of the place with their delectable seafood menu and drinks. The Vila Beach Restaurant offers great variety of seafood cuisines cooked in a blend of international and local style. The food and environment of the Vila Beach restaurant are amazing. The Vila Beach Restaurant is located at Jumeirah Beach Road Dubai. As suggested by its name Waterside Seafood Restaurant and Terrace offers delicious buffet of seafood in Dubai, combined with riveting and relaxed dining atmosphere around. A wide food variety ranging from lobsters to clams to crabs, you have everything here perfectly cooked to the divine flavors. You also have the option to choose to dine in-house or on the open deck to enjoy your favoring drink and Shisha in the open air. Waterside Seafood Restaurant and Terrace is located at Al Murooj Rotana, Sheikh Zayed Road Dubai.